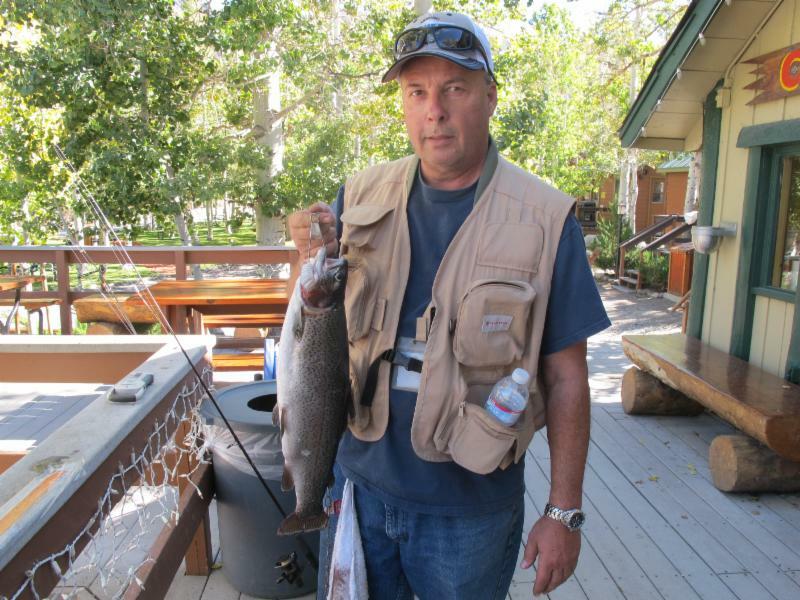 For the second week in a row we had a record fish for the 2014 season photographed at the resort. 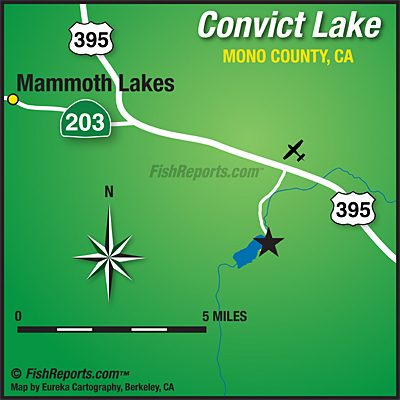 This reports "catch of the week" was the largest fish caught from Convict Lake that was checked in at the general store. Congrats to Craig Miszklevitz with an amazing catch. Lures and jigs landed some nice trophy trout this week. Bait fishing with nightcralwers also remained hot. The Morrison's Bonus Cash Weekend is only two weeks away. Come join us on the weekend of Oct. 31st - Nov. 2nd for a chance to win $2000 in cash prizes. The one weekend it pays to fish. Catch of the Week: Craig Miszklevitz from Lancaster, CA hooked a 8 pound lunker which resulted in the "catch of the week" and the "catch of the year". Craig was using a Sierra Slammer Swimbait and he was fishing the North Shore. Congratulations Craig on an amazing catch! Tactics/Bait: Kastmasters, Thomas Bouyants and Tasmanian Devils were doing well at the lake. The top colors were Black Thunder (Tasmanian Devils), Red/Gold (Bouyants) and Gold or Silver (Kastmaster). A Sierra Slammer Swimbait landed the largest fish of the season. I'm a big fan of these swimbaits. I've done well with the Grasshopper, King Crimson and Blue Skiner colors. A lot of different colors of Powerbait were working especially anything with garlic.The most successful Powerbait colors were yellow, green and rainbow. Inflated nightcrawler caught some nice rainbows this week. The North Shore and inlet were the hot spots. Other locations fishing well were the Inlet, Hangman's Tree, Jetty and South Shore. Weather: Highs are going to be in the low 60's and the lows in the mid 30's. The forecast is for mostly sunny throughout the beginning of next week and breezy on Monday. Here is the National Weather Service link that is usually quite accurate: 7-Day Forecast Convict Lake. Sunrise - Sunset: Sunrise this week 7:07am - 7:12am and Sunset 6:16pm - 6:08pm. Stocking: no stocking scheduled this week. The next plant of trophy trout at the lake will be October 30th. 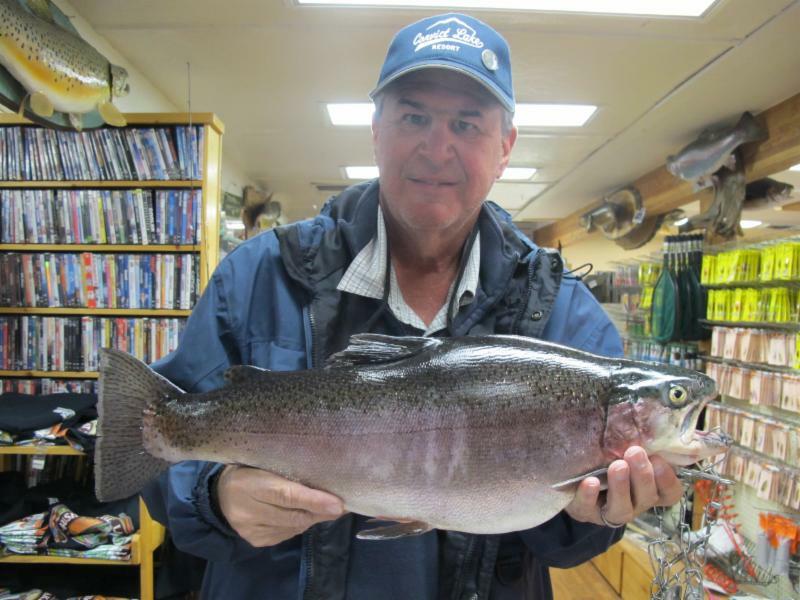 Flashback from last week: El Rancho Dons from Pico Rivera, CA landed a 3 pound 12 ounce rainbow while fishing at the Inlet. They were using Powerbait.